In honor of my son’s Harry Potter birthday party today, I read the last of the Harry Potter accessories that I hadn’t yet read. 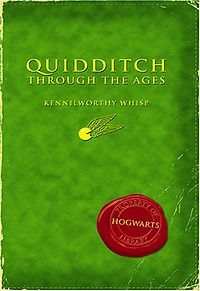 Quidditch Through the Ages comes packaged in a two-book set with Fantastic Beasts and Where to Find Them, which I read about a year ago. I’ve had the set forever, but as they are very short (this one is only 55 pages) and aren’t terribly significant to the HP series itself, I didn’t bother to gulp them both down right away. Surprisingly, Quidditch is an interesting read, all about the history and evolution of the wizarding sport. It’s humorous in places, and explained some references in the series that aren’t necessary to know, but are fun for an HP trivia buff like me to pick up. They aren’t all related to Quidditch, either. For example, I now know the origins of the name of the ward Mr. Weasley recovers in around Christmas of the fifth book (“Dangerous” Dai Llewellyn Ward: Serious Bites). Totally not necessary to know for plot, totally great to know for my own pleasure. The double book set was written and published for the purposes of raising money for Comic Relief, a children’s charity in the U.K. This entry was posted in 2009, Children's, Prose and tagged Harry Potter, speculative. Bookmark the permalink.